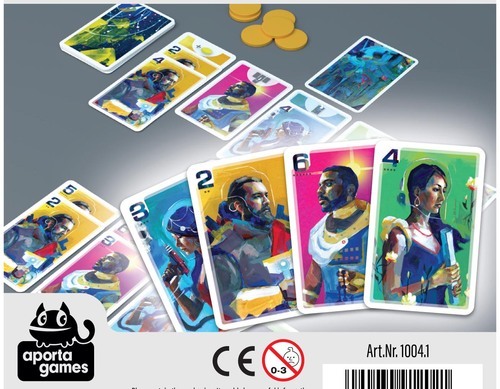 Capital Lux is an interesting card game set in some sort of futuristic setting – though there really isn’t much backstory given in the rules. Each player has an area on the table in front of him which is his Hometown. The center of the table is known as the Capital. The four Capital cards – one for each colored suit – are laid out in the center. The 4 Modifier cards are shuffled and placed in a face-down stack. A start player is randomly decided. The game plays over three rounds, with each one following an identical format. There is a deck of 72 cards – in four different colors with values varying from 2-6 – and each player is dealt five cards at the beginning of each round. There is then a draft; each player chooses two of his hand cards and places them face down on the table, and the remainder are passed to the left. Then, from the newly gained hand of three cards, each player again chooses two to place face down in front of him and then passes the final card on. Each player will end this draft with 5 cards; 4 of which he chose and one which was given to him at the end from his neighbor. Players will take turns playing cards – the main choice is whether to play it to their hometown (in front of them) or to the capital (center of the table). Cards played in the hometown can eventually turn into victory points. Cards played to the Capital will affect which cards might score AND the player will most likely get a special action from the card played to the table depending on the color of card played. Regardless of where the card is played, it should be placed in a column with other cards of the same color. Arrange the cards so that the numbers on the cards are easily visible and can be summed. Players take turns playing cards in order until one player plays his final hand card to the table. At this point, all other players get one more chance to play a card (if they have any left themselves). Then, any unplayed hand cards are automatically placed in the Hometown area of the player holding them. There is now a reckoning – first, all the modifier cards are revealed above the Capital columns. The numbers on the modifier card(s) (+4, +2, -1, -3) will affect the total value of the column they are next to. Each player now compares the total in each color in his hometown with the matching colored column in the Capital. If the total value of any column in your Hometown is GREATER than that of the matching one in the Capital, all the cards of that color are discarded from your hometown. If you have collected gold discs, you can spend them to reduce your effective Hometown total – one point less per gold coin spent. Then, the player with the highest score in each color (in their Hometown) gets to take the highest card from the matching column from the Capital. If there is a tie, it goes to closest to first in current turn order. Then, the second highest score in each color takes the next highest card available in the matching color. These bonus cards are placed face down next to the player – they are NOT added to your Hometown columns! The player with the most points wins, ties go to the player with the most scored “6” cards. There is an interesting push-pull from the card playing here. While you’d like to play as many cards as you can to your own area in order to score points, you have to also contribute to the center in order to make sure that you stay under the limit. Additionally, each of the special actions can be quite valuable at the right time, and there may be plenty of times when you just need/want to take a particular action rather than play a card to the table. Keeping things together from round to round can also be a challenge. If high cards are played to the Capital early, you might be able to get a fairly high score yourself in your hometown in that color. However, as the two highest cards in every color are removed after each round, you might find yourself starting the next round way over the limit. Hopefully you were able to collect a nice bonus card at the end of the previous round, because you’ll now how to work fairly hard to get back under the limit in the next round – or you’ll lose all of those cards! The modifier cards seem to be the swingiest – and those are the ones I try to control when I play – I just like to know where they are. Though, you can often infer what sort of modifier is on each stack by remembering who played the card to a particular stack and then basing your decision off of their current Hometown standing in the color. Thus far, the games have been tense, especially near the end of the game. Oftentimes, players are pushing the envelope, trying to max out their score in a particular color –and sometimes relying upon other players to play cards to the Capital to save their bacon. Having to discard an entire color at the end of the third round can be a killer, but that’s what makes the game exciting. 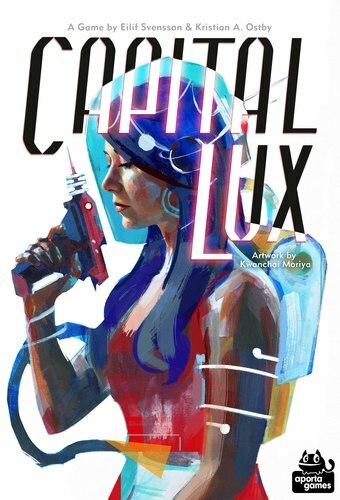 Capital Lux is an interesting filler card game, and I suspect it will continue to hit the table in the months to come. I am looking forward to playing with the real cards as right now I’ve only had a PnP version to try it out with.